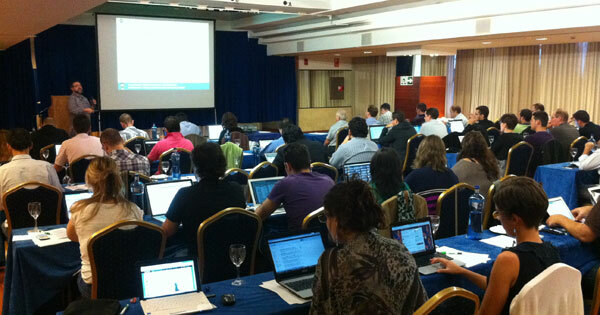 I have attended ‘Congreso SEO Profesional’ a couple of times (in Valencia and Madrid). The event is organised by ‘Marketing Online Valencia’, an agency that takes pride in using analytics at the heart of their online marketing strategies. This SEO conference outstands from most of the mainstream conferences in Spain in that it is a guerrilla-based, tactical SEO conference on steroids. Having attended other similar tactics-based conferences in the UK, eg: SEOmoz Pro training, I can comfortably state that this conference was of equal of even higher value to anyone who wants to learn the nitty gritty of doing SEO. With only two consecutive years running, the Congreso SEO conference in Valencia, has become popular amongst industry professionals for its transparency towards all sorts of SEO tactics. That is, blackhat SEO presentations are encouraged as much as other types of instructional or educational sessions, eg: advanced analytics. The requests for speaking are carefully scrutinised by the organisers to ensure all presentations are of high value. There were speakers from all sorts of sectors and levels: from consultants and freelancers to SEO agency owners and from small business owners running a one man show (Juan Palomo) to in house SEOs working for small and medium-sized businesses. All of them are professionals willing to tell and show their case studies (real life projects) either of their own or that of their clients. So what’s said in the conferences doesnt get shared. You can read about the programme and the full list of speakers following their enewsletter. Typically this section is always left for the end of the post, but I am going to mention the attendees first because it is with them that I learned the most and shared the best moments of this conference. The first night before the conference I was lucky enough to catch up with a group of lads with very diverse profiles ranging from white to black. It was a fantastic start to building lots of interesting contacts (and links of course). The next day during the conference, I met many more SEOs some of whom I only knew via Twitter. The various blackhat-related tweets that went round during the conference may have either prompted you to think that you would like to attend, or put you off from attending. I would like to clarify something: none of the sessions, in my opinion, were solely blackhat. It is true that there was an uninhibited and constant display of blackhat or greyish techniques throughout many sessions, but the ‘Congreso SEO professional’ conference is highly educational. If any, you need to have a fair knowledge of the Spanish language to take advantage of all goodness going on. The informational sessions were to say highly informational in the sense that they were going to the point with the ‘meat’ of the topics. For example the magnificent explanation of the Panda update algorithm covered by Carlos Redondo in the Valencia 2011 event was great. He compiled a massive amount of information, including dates, events, and facts. He analysed every possible angle of the Panda update to help us all understand the intricacies and specificities of this new algorithm. Equally fulfilling was the ecommerce-oriented analytics session delivered by Fernando Macia. He staged a brilliant, fast-pace demonstration of efficient analytics and ROI-drive decision making using e-commerce scenarios in his presentation. I personally found Paul Gailey’s infographics sessions both strategic and tactical, yet creative and inspirational. Not because infographics may be a new thing at all, but because of the guidance given, the tools and tactics tips he gave us and the depth of his presentation. As I said earlier, many of the sessions have a blackhat component, but at the same time they are all highly instructional too. It is up to the participant to decide what to do with the knowledge acquired and how much of the naughty stuff you want to implement. David Carrero’s presentation on speed load optimisation shined because of the real life scenarios he used. He demonstrated how site traffic can improve through speed load optimisation. David even embedded a touch of greyhat in his slides by suggesting that some of the images used for your site’s interface could be hosted on an external host (eg: Google blogger) to minimise the number of calls on one’s server as well as the use of image sprites. He also covered CDNs which is something I am 100% concerned with in my in-house role. There were great case studies on websites affected by Pandan, the specific business models, the challenges faced up when they got hit by Panda, the post-Panda actions and solutions they implemented to alleviate the fall in traffic. One of these two cases even had an international dimension: the Brazil market. The other one was based on the fast-moving, highly competitive sector of travel. Not sure I am allowed to mention the name of the companies. The SEO Tool showcase sessions were instructional too to the point that they all contained an element of case study and taught us not only how to use the tool, but what aspects of competitor analysis to focus on and what data to extrapolate to help draw conclusions on actions. They definitely brought in just about as much value as the case studies. I am only mentioning a few of the speakers, perhaps they ones that for me were matched to my main interest in the enterprise. This however doesn’t go to say that all other sessions were not equally interesting and useful. Every one of the sessions shed value and contributed something valuable. For example the session on Google Local by Jorge Gonzalez from Publigrup was a cracker! The organisers made it very clear from the beginning to keep some of the content quiet and refrain from letting some of the sensitive stuff out: the names of the companies used through the case studies, details on the blackhat tactics or methodology mentioned by the presenters. They wanted to keep the uniqueness of the content to the attendees and due to this atmosphere of exclusivity, everyone seems to be more prone to give you their best tips and tricks both through the sessions and outside, during coffee, drinks or other networking times. If you decide to make the move to Valencia (perhaps in Madrid next year?) and join one of these conferences, you will not only enjoy and learn from the sessions but also the networking. Which of the two gives you more value? I wouldn’t be able to choose between the two. The sessions are great, but it is through the networking on all conference that you always exchange, share and discuss viewpoints, strategies and tactics that may or may not work for each sector or business model. If you look to learn blackhat, I’d say that it is through the networking where you are more likely to learn than during the sessions. On the ‘Congreso SEO’ the added bonus is that people go round looking for opportunities to exchange links. They are all keen to proposals that entail collaboration on content-supported links, straight link exchange and any kind of link building collaboration. Nearly everyone runs their own websites and boasted a number of blogs and websites, some even large number of blogs. In turn, mostly everyone I met encouraged and supported the idea of collaboration based on a safe one-way link approach. Lastly, how could I possibly finish this post without mentioning the great social momentum at Red VLC, one of the trendiest and most prestigious clubs in Valencia. Participants, speakers and other local SEOs were invited over. We were treated to a sophisticated tapas dinner with great food, wine, cocktails. The conversations revolved around all sorts of technical SEO stuff, exchanging & buying links (‘linktonics’), SEO tricks & tips, buying domains, ‘JuanPalomo’ SEO and even Corporate SEO. Everyone had a lot of fun and it seemed that, for some, the party carried on till wee hours. When I left at 4.30 am, I got the impression that the majority were still at the club talking ‘SEO lingo’. This conference has been without any doubt the most instructional, educational, valuable and enjoyable SEO conference I have attended for a good while. Other conferences I usually attend are good too, eg: ISS for example as it has a high component of ‘International’ stuff, which is irreplaceable for the kind of corporate SEO I do, but Congreso SEO has contributed significantly to my overall SEO knowledge. It is to say that a lot of the stuff you learn here presents a big ‘no no’ into a corporate environment, but it is still interesting and useful stuff to learn about. Blackhat, spam and manipulative SEO is out there and you want to make sure you understand it just so that you can identify and understand it when/if your competitors use it. Great post David! I hope to meet you soon on another SEO conference. I have a lot of fun talking about black hat tools with you and Guillermo on RED VLC. Thanks a lot for comming this year and for your great post. hi Daniel, I did listen to your case study presentation with a lot of interest, but I did not feel that it was the most fruitful presentation for me, as an inhouse SEO. That doesn’t go to say that it wasn’t good because it really was, but I have mentioned most sessions from the perspective of my own inhouse role at the British Council. Don’t take it the wrong way…you will see that I haven’t mentioned others either, like Sam Crocker, from OMD. His session on competitor analysis was very instructional, and loaded with good stuff. But I don’t do much competitor analysis in my current inhouse role as an inhouse SEO strategist, so I didn’t mention him. Cuidate y suerte con ipadizate!